As an aside, the proposed link to Iceland does not go through Scotland, perhaps because their not exactly sure that Scotland will be a part of the UK after 2014? But then again, maybe this is just an artist's impression. The point of these interconnects is to balance load between a variety of green and greenish generation methods. The French link, of course, can network in the nuclear plants in France, the Norway links take advantage of pumped water storage and other hydro capabilities. Spain, in addition to rain has a lot of wind on the plain which it already covers a significant fraction of its electrical needs from. Ireland has potential excess wind generating capacity and there are plans for new tidal electric generation in France. Although not shown here, Sahara solar could easily be linked to Europe by the same technology. A hidden implication is that as long as a number of countries continue to develop nuclear political decisions to forego may not have much of an effect on the continental scale, with the developers selling power to the others. If this is the case we may see many such links between Japan and Asia. Eli wants to stress the non-breakthrough nature of these initiatives. This is not pie in the sky carbon capture so favored by Ethon's food groups. The Pie PushersTM ER are, like those who favor birth control by thinking pure thoughts, fabulists. These are significant, commercial projects for which financing is available, and construction underway, quietly, but to good effect. The technology was developed over the past few decades and is currently available. The net is to ameliorate the intermittent element of wind, solar and tidal power. Repeating Rabett (Ms. Bunny has problems with that) wants to point out again that in a Science Policy Forum article entitled "A Road Map to US Decarbonization", (available in part in the Energy Bulletin) Reuel Shinnar and Francesco Citro point out that while nuclear is well suited to support baseload electricity generation, solar is ideal for handling peak demand, being most available, when most needed, during the hot days. Same goes for wind and tides, it's always blowing somewhere. In theory if you can move those electrons about, the wind can power the electrical fans where the sun is too hot, which.... oh well, let's not go there, somebunny will start muttering about the Second Law. This proposed link has been around for at least 22 years or so. And I think the link from Iceland (or at least one anyway) is mooted to come in at Peterhead, which is a "few miles" north of the border. See here. See also this from the Guardian last year. Scotland doesn't necessarily need a link to Iceland anyway. We have lots of wind (Although as usuall it isn't as good as people like to think it is) and in order to go carbon neutral for our energy simply need to build 4 more nuclear stations (2 to replace the current ones) and increase wind, wave, tidal and micro-hydro power. England has it worse, with a lack of space and much greater energy demands. PRevious and current governments have dithered over energy generation, partly because of 'free' market blinkers, partly because of the large uncertainties associated with it all. Thus in about 6 years time there will be an energy crisis as older nuclear etc plants are shut down and not replaced. The only ones to benefit will be gas generators, which whilst better than coal, are still nowhere near low carbon. Either way they'll end up importing large amounts of electricity. The canny Scots, are fully aware, that the bountiful harvest of toxic carbon pollution slime from the North Sea, is coming to a rapid end. In addition, the Sassenach's of Westminster, stole the lion's share of the toxic carbon pollution slime royalties and leaving the Scots the daily bathroom oily scum ring clean up bill too. Well, you would have to be a complete deaf, dumb and blind mononeuron living with your head buried in the concrete sands of stoopidity, not to notice, a one third fall in daily production levels, at the Scottish North Sea Aberdeen well head, in the past two years. Watt better way to get even, with the Sassenach's south of Hadrian's Wall, to charge them a gold premium price for the power generated by the plentiful wind and bluster, produced by the Scots, since the days of William Wallace and the hairy beast that sort of looks like a cow with lots of red hair, much like the thing from the Addams family wearing a viking helmet? It is a unique well known phenomena, that a few selected well connected wealthy and very sensitive "Nimby's" living in Sassenach land, south of Hadrian's Wall suffer from a disease called "Trumpus Nonsensus Windmillitus", or an imaginary aversion to the sight of windmills(something you don't see on the eastern side of the North Sea in the land of the Vikings or Germanus). I believe their was a recent outbreak of this disease, at Hyannis Port, from the one day wonder summer residents living in Millionaires Holiday Shack Row. The Scots may be tight-fisted with the pennies and cheap too, but they aren't stoopid either. Ultimately, they will figure out a way, to get all their stolen North Sea gold, plus a thousand years worth of interest, from the silly Sassenach Nimby's living south of Hadrian's Wall. Anon -- "Watt better way to get even, with the Sassenach's south of Hadrian's Wall, to charge them a gold premium price for the power generated by the plentiful wind and bluster"
And the Welsh are being encouraged to do the same with their ample water supplies. Scottish hydro already replaces 100% of the electricity coming into my Englishman's castle. I'll bet the Wesminster set didn't expect their free market zeal to come back at them quite in this manner. Wake me up when any contracts are actually let. Until then its just more gold at the end of the rainbow. Pk, I'm awake. What is the capacity of these transmission lines compred to the loads on each end? But the fact that contracts have been let suggests economic value for those anyway. The UK does not have major Summertime air conditioning loads, the main reason being.. UK summers. Peak electric usage is in the winter. Although daytime electric usage is higher than night, so solar has it's uses. 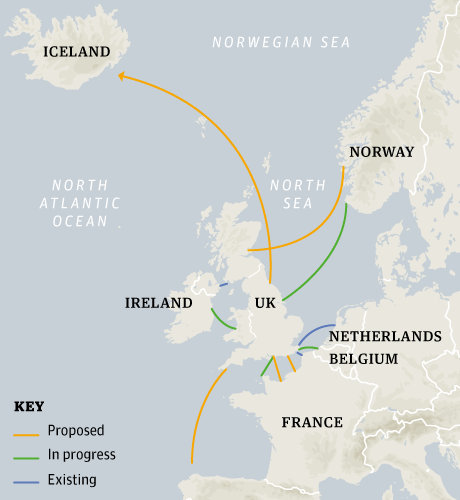 I'd guess that the interconnect from Iceland would go as close to the English SE as possible before coming ashore, because that's where the demand is and running big power lines under the sea is probably easier than getting planning permission for a long overland line. The issue of wind and scottish independance is quite interesting.. because should the UK decide to build a new Nukes in lieu of importing electricity, those nice scottish wind farms will find themselves short of any actual customers. Could be interesting. Surely, Fluffy Somerset Bunny, the point about the National Grid is that it doesn't matter where in the UK a power station is located (within reason of course; the nearer the HV transmission backbone the better). And the proposed "offshore power station" that is the Iceland--UK connection is, in effect, the same as siting an onshore power-generating station at Peterhead, isn't it? The main (HV) transmission grid in Scotland (owned by SSE and Scottish Power, rather than the National Grid in the rest of mainland UK) already runs very close to Peterhead (if not through it), as you can see from this schematic; surely a prime factor in its proposed termination there. So, I can't see any need for a new "long overland line" to the overpopulated and underresourced SE by siting any Iceland-UK terminations at Peterhead. True, Scottish independence might throw a spanner in the works about the proposed location of the link's termination. But I'm sure binding contracts can sort out any "little niggles" about things like ownership and rights of way, so to speak. Then again, perhaps it is the practicalities of the possible political fallout that is being conveyed in the figure Eli has chosen in his piece above. Teeside, or thereabouts, is the furthest south it would likely need come if the Scottish "problem" is considered "problematic". PS repost. Is the proprietor of this warren aware that Preview panel's word wrap is off (when viewed in FF11 anyway)? Is it a new Blogger "feature", maybe? Well, Iceland will not be part of the UK either, so what's the difference?